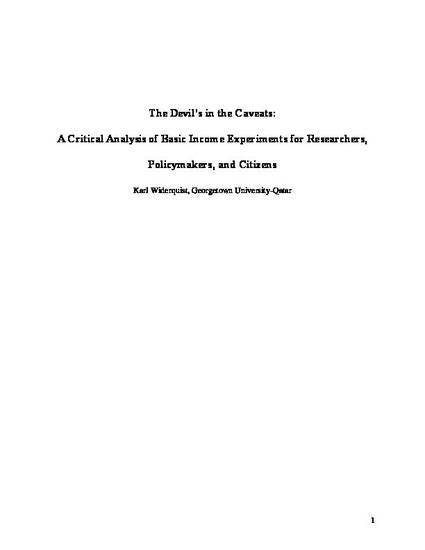 The devil’s in the details is a common saying about policy proposals. Perhaps we need a similar saying for policy research, something like the devil’s in the caveats. I say this both because nonspecialists (the citizens and policymakers who are ultimately responsible for evaluating policy in any democracy) have great difficulty understanding what research implies about policy and because specialists often have difficulty understanding what citizens and policymakers most hope to learn from policy research. This problem creates great difficulty for Universal Basic Income (UBI) experiments which are now getting underway in several countries. These experiments can add a small part to the existing body of evidence people need to fully evaluate UBI as a policy proposal. Specialists can provide caveats about the limits of what research implies, but nonspecialists are often unable to translate caveats into a firm grasp of what that research does and does not imply about the policy at issue. Therefore, even the best scientific policy research can leave nonspecialists with an oversimplified, or simply wrong, impression of its implications for policy. This short book discusses the difficulty of conducting UBI experiments and communicating their results to nonspecialists given both the inherent limits of experimental techniques, the complexity of the public discussion of UBI, and the many barriers that make it difficult for specialists and nonspecialists to understand each other. This book is an effort to help bridge those gaps in understanding with suggestions in an effort to help researchers conduct better experiments and communicate their results in ways more likely to improve public understanding of the possible effects of UBI.